The Washington Capitals are within two victories of their first Stanley Cup title after defeating the Vegas Golden Knights 3-1 on Saturday evening. 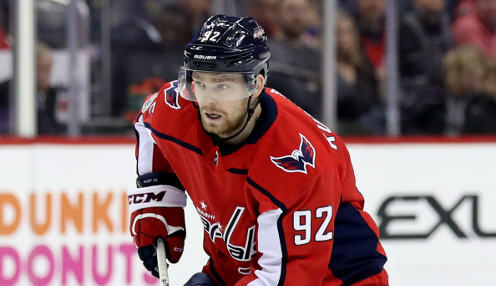 Alex Ovechkin, Evgeny Kuznetsov and Devante Smith-Pelly scored for the hosts at the Capital One Arena after they grabbed the home ice advantage by splitting the first two games in Las Vegas and Washington can take the Cup just by winning their remaining home games in the series. Of course winning at home has been rather difficult for the Capitals in the post-season having lost twice in Washington against both the Columbus Blue Jackets and the Tampa Bay Lightning while losing once to the Pittsburgh Penguins. Curiously the Capitals closed out their series against all three opponents on the road, defeating Columbus and Pittsburgh in six games and Tampa Bay in seven. The Golden Knights find themselves in even more uncharted territory. The expansion franchise that stunned the hockey world by winning the Pacific Division title and then getting the better of the Los Angeles Kings, San Jose Sharks and Winnipeg Jets, now trails for the first time in the playoffs. Win in Game 4 on Monday and Vegas will fancy their chances in what would be effectively a best of three series to conclude the season. However lose to the Capitals and it would be hard to imagine the Golden Knights winning three straight including a winner take all Game 7. Then again, it's been hard to imagine the heights that an expansion franchise could soar to, only to see Vegas exceed expectations consistently this season. The Capitals are 2/13 to win the series with the Golden Knights 19/4.